I have a configuration, to backup a USB-stick (G:) to my local NAS System. Error reported while accessing file: G:\System Volume Information\ => Der Zugriff auf den Pfad "G:\System Volume Information" wurde verweigert. May I ask for some tips, tricks, what´s wrong, or how to avoid these messages. Is it necessary to back up the System Volume Information folder? (LVM) and requires root privileges. I don’t think so. 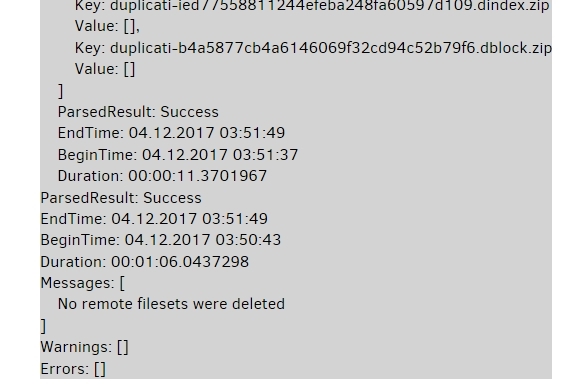 Duplicati would just be triggering the VSS API to create the snapshot, and Windows itself is responsible for doing the actual work and putting data in System Volume Information. I bet the OP has the entire G:\ drive selected for backup. Excluding System Volume Information would be the right approach to solving this problem. As you stated you do not want to back up this area anyway. My itension/aim is to backup all “user data” from the stick. I am not interested in an other information, maybe the operation system need this. With a modification of my backup configuration, the backup will be done, without error and warnings. I’m a bit ashamed that I did not find the solution myself. For me, duplicati is a very useful, helpful powerful tool. It’s good to hear things are working for you now! If there was a particular post that gave you the “fix” feel free to check the Solution box . OP means “original post” or “original poster” - it’s just a shortcut way to refer to the first post or the person who made the first post. System.UnauthorizedAccessException: Access to the path 'Z:\System Volume Information' is denied. System.UnauthorizedAccessException: Attempted to perform an unauthorized operation. But when the job ran today, I got the same 3 warnings again. Am I doing something wrong? IIRC, ending the exclude with anything other than \ or / treats the filter like a file. If that’s correct then your rule will exclude all contents of the folder, but will still try to access the folder, thus causing the error. Try putting -*\System Volume Information\ in the “edit as text field”. Unfortunately, this didn’t help either. Still getting the warning. You are basically saying that what you suggested will probably not work, right? Well you were right. So I have to try *\System Volume Information\ then? @Matthias, how exactly did you get rid of the warnings? Due to the case, that my USB stick is always G:\ … the Exclude Folder Option works fine. So I have to try *\System Volume Information\ then? Yes. 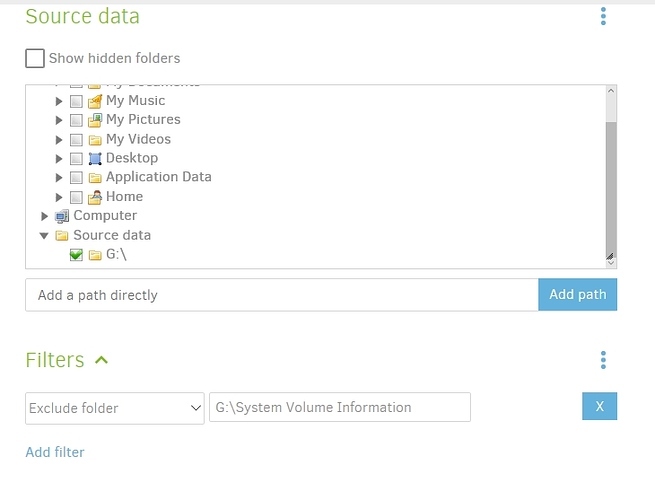 In the two-field setup for “Exclude Folder”, you would put in *\System Volume Information\ (the “-” is added automatically behind the scenes), but if you’re using the “Edit as text” option (the three dots menu just across from the “Filters” line) then you need to use -*\System Volume Information\. But then I thought, since I want to exclude those system volume folders globally anyway, I might aswell go for the global option --exclude="*\System Volume Information\*"
I might aswell go for the global option --exclude="*\System Volume Information*"
So, I’m wondering why the GUI accepts that option in the first place if it is not supported at the global settings level. I also tried --exclude=*\System Volume Information\* but with the same results. I can’t believe how much time I’m spending at doing a simple thing like excluding a some folders. And it finally seems to have worked. The disadvantage is that I have to enter this for every single backup job. Why is it not possible to globally exclude stuff? It might be worth including \System Volume Information\ in the standard “System files” Exclude option. This should actually work because it will not look in the folder after it has been excluded. But * means “zero or more characters” so the original filter should also work. Why is it not possible to globally exclude stuff? Unfortunately it is because “order matters”. As we allow both include and exclude filters, there is no sane way to simply mix two lists of filters without getting a lot of surprises. Imagine one rule is exclude *, putting that first and last has two very different outcomes.